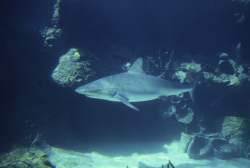 What is the truth about scuba diving with sharks? Is it really as dangerous as most people seem to believe? I don't know if it is the everlasting "Jaws" effect or what, but alot of people seem to have a fear of shark attacks as soon as they step foot in the ocean. The first question many people ask when they find out you scuba dive is "Have you ever seen a shark?" And when you tell them you have, they think it is a miracle that you are still alive and talking to them. OK, this may be an exaggeration, but you know what I mean. I'll tell you my experiences of diving with sharks and yes, I am still here to tell it! When my then boyfriend (now husband) first asked me if I wanted to get certified, I replied "Sure, but I don't want to see any sharks." See, before I started diving I had the same attitude about sharks that most people have. It has changed now. Of course, you know one of the first things I saw on my first dive after I was certified? That's right, a shark. I remember my heart felt like it was going to beat out of my chest. And the fact that we had a crazy divemaster that grabbed my hand and had me pet a sleeping (or resting) shark did not help matters (this is crazy and you should not do this; it was my first dive and I didn't know what was going on or what he was going to do). I just kept my eye on the shark and tried to stay out of his way. I survived, alot more adrenaline in my blood then when I started, but it was fine. Since then, I can't count how many times we go diving and end up scuba diving with shark(s). We probably see sharks on about 25% of our dives. My heart doesn't beat so fast anymore. You get used to them. 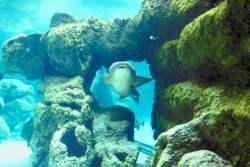 The most common types of sharks we see are nurse sharks and reef sharks. I have only seen one hammerhead shark. We were on a wall dive off of San Salvador in the Bahamas.. I looked down and there was a hammerhead circling up towards us. (Cue the fast heart beat!). It was my first hammerhead sighting and I was nervous. My eyes were glued to that shark but he just came up and then swam away. Uneventful. That is how the vast majority of shark sightings go. When you are scuba diving with sharks, just mind your own business. Don't go chasing after them or pet them or anything else to them. I have never felt threatened by any sharks we have seen in the Caribbean. My heart may have beat a little faster but that was caused just by the sight of the shark, not by anything the shark did. From my experiences of scuba diving with sharks, if you don't disturb the shark, the shark will not disturb you. As opposed to ending up scuba diving with sharks during the normal course of a rec dive, there are places that offer organized dive tours solely to feed sharks. 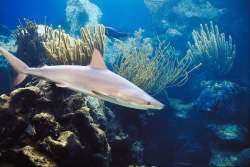 The Bahamas is probably the most famous of all the organized shark diving locations. And the most well known operator of shark diving in the Bahamas is Stuart Cove. In these scuba diving with sharks excursions, divers will typically kneel on a sand bottom in a semi-circle. A diver will then come in with a bait box and begin feeding the sharks that have gathered (the sharks get used to this feeding and congregate in anticipation of the meal to come). The feeder will usually feed the sharks with bait on the tip of a spear. During this shark diving Bahamas experience, the sharks will swarm around and get very close to the divers. Personally, I have never done this type of shark diving in the Bahamas. It is not without controversy with critics saying that it interferes with the natural pattern of the sharks, etc. I am guilty of scuba diving with stingrays in Grand Cayman which isn't much different. So I am not one to judge. It's your call. So you are thinking of shark diving in the Bahamas, or just regular diving in the Bahamas. And you want to know how many Bahamas shark attacks per year there are? The good news - not many. The International Shark Attack File has on record 238 shark attacks on divers worldwide (from 1580-2006). Of these 238 shark attacks, 15 or 6.30% have occurred in the Bahamas. Looking at it from another angle, the Bahamas has 25 recorded unprovoked shark attacks for the period 1749-2006 (not just scuba divers). Of these attacks, only one was fatal and that occurred off of Exuma in 1968. Thus the average number of Bahamas shark attacks per year is extremely close to 0. So if you go diving in the Bahamas, rest assured that your chance of being attacked by a shark is almost nil if you don't provoke the shark. Mexico has 37 recorded unprovoked shark attacks for the period 1880-2006 (not just scuba divers). Of these attacks, 20 were fatal. Quintana Roo, where the popular scuba diving mecca of Cozumel is located, recorded 5 unprovoked shark attacks for this period. All of these shark attacks were fatal with the last one occurring in 1997. As I stated above, The International Shark Attack File has on record 238 shark attacks on divers worldwide (from 1580-2006). Of these 238 shark attacks, 4 or 1.7% have occurred in the Mexico. So here again, while unprovoked shark attacks do occur, they are very rare. No matter whether you experience shark diving in the Bahamas with an organized tour or you end up scuba diving with shark during a normal rec dive, relax and have fun. Just don't provoke that shark. Here's to diving with sharks - Let 'em be!